Food Review: Get your chicken on? | What, Where, and Wen! It was supposed to be an innocent stop on the motor way from Normandy back into Paris, right? Right. This glorified AM PM, served up a good deal of brasserie-style foods and snacks for the liking. Picked up my ham, smoked ham, cheese, and salami on-a-baguette sandwich, snagged an extra large bottle of water, and then my hands were led onto a nearby shelf, chock-full of bags of Lays’ potato chips. Or po-tah-to. Whatever. 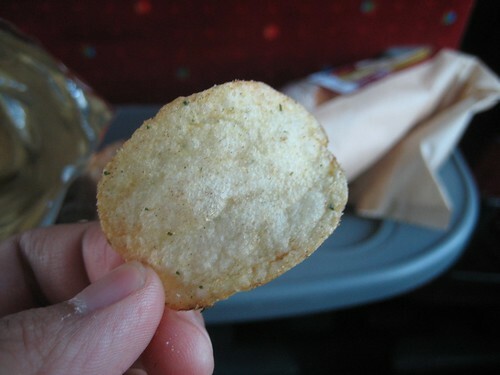 What distinguished these chips however, was the fact that I would likely never see them again. 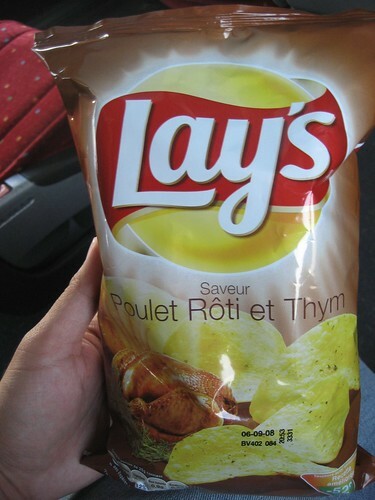 Roast Chicken & Thyme flavored potato chips? Was that just plain wrong, or just plain well-intentioned-over-indulgence by the creators? You decide. This ‘characterful’ choice of flavor infusion seemed a bit risky to me. What were they thinking? The Americans behind me saw the bewilderment, and the photo op. We had a good laugh. Bringing a culinary delight as its name implied to our favorite crisps was worth a try. Upon the first taste, it became apparent that the chicken skin, juices, and marinades formed the outter layers of the crisp. After a bit of lingering, the spices kick in. This incongruency of taste gave an earthy progression and arch of flavors for the gamut of my tongue. I appreciated the effort on their behalf, however, after half a bag of saturation for my mouth, it became like most other vigorously over-flavored foods. I have to say it, but it tasted like chicken. Not in the best way either. I give it 3 crumbs up and a crouton for the French effort. Vive le poulet! in Australia they definitely had chicken flavored potato chips. all the Americans were like huh? Man, I was like, Where’s the foie gras and the 2001 Loupiac baked Lays?! Hey man, you’re a good writer. I especially like the “3 crumbs up” bit. I’ll admit it, I laughed. hahaha…I’ll have to agree with Brandon. I love reading your blogs.